After a week of religious affairs and a low point (the Danakil Depression) in the north, we shifted our attention to tribal matters in the south. 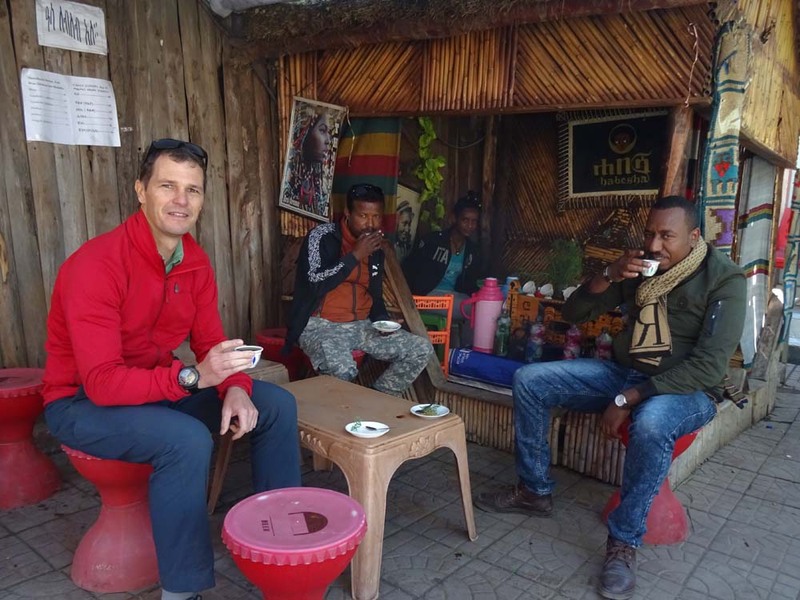 In that first week we also spent a few days in the Simien Mountains, but we’ll tell you all about our wildlife encounters in Ethiopia’s Simien and Bale mountains in our next adventure story ‘The hunt for the red wolf’. Starting in Jinka, we met Abiy, our guide, and Habtamu, our driver, at the little airport. 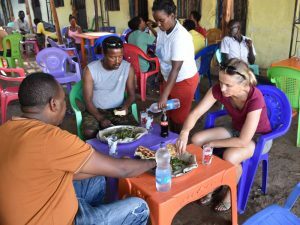 We had planned a small loop from Jinka, as well as some side trips to visit villages of the Dasenech, Hamer, Mursi, and Ari. 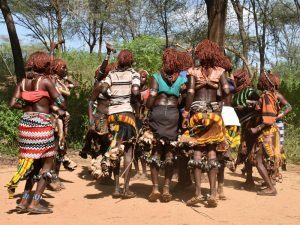 Giving ourselves a glimpse into the lives of the people of these fascinating tribes in the Omo Valley. 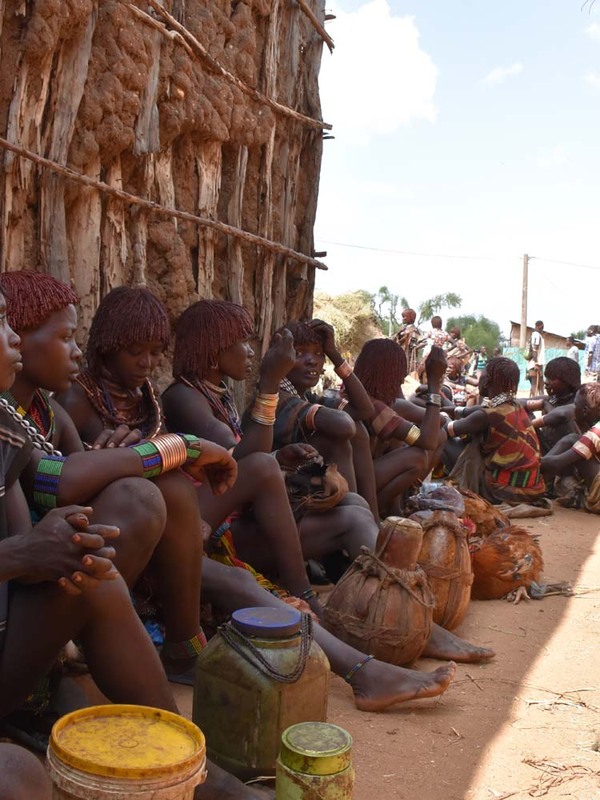 Around 20 tribes are found in the Omo Valley, some as small as 500, others larger with tens of thousands of people. 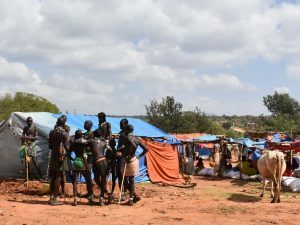 It is a remote corner of Ethiopia, where the tribes live the same way as their ancestors hundreds of years ago. Where raiding cattle is a way of life, and boys and girls undergo strict tribal initiation rites to become men and women. 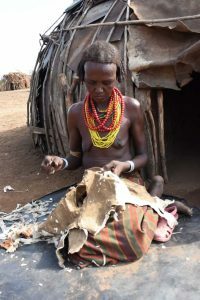 Where the traditional dress is worn with pride, and animism, and all its rituals and believes, still rules their lives. 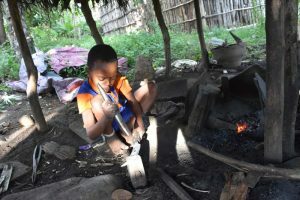 It is a harsh life, often violent, but the tribes have found ways to cope with the extremes of both the climate and their environment. It is a place of amazing colours and beauty, and of desolation and increasing pollution (plastic). 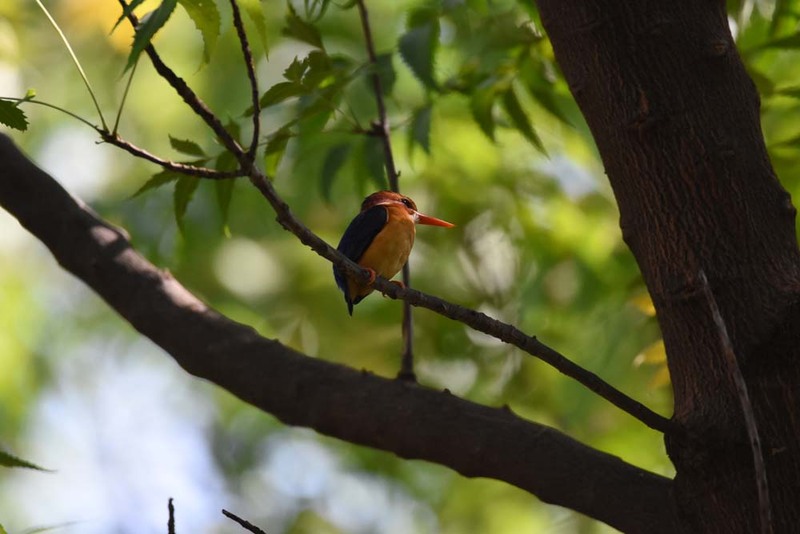 Will it survive the way it has for centuries? Are tourists helping the tribes continue their way of life, or are the cameras hastening their demise? Or are the dams being built for hydropower the beginning of the end for these proud tribes? 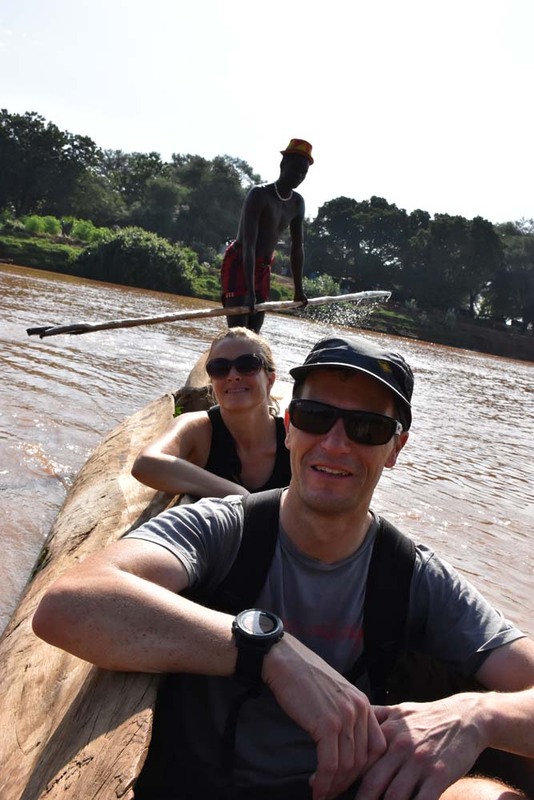 Although there is a new bridge across the Omo River in Omorate, a small, modern town only about 50km from the Kenyan border, they prefer to ferry tourists across the muddy-brown, bilharzia infested river in a dugout canoe. We picked up our mandatory local guide and walked along the river to the village. 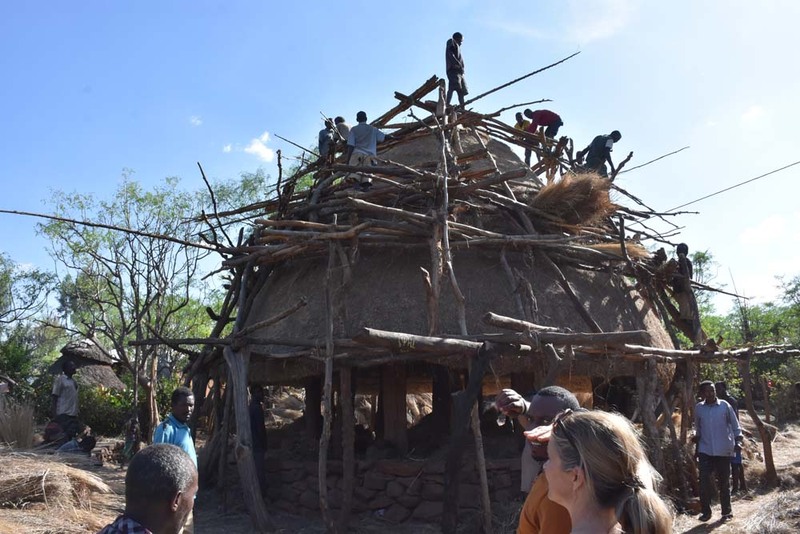 The Dasenech live in flimsy, domed huts, which were practical when still nomadic pastoralists. But now, living in more or less permanent villages along the Omo River, they grow crops, fish, and raise their cattle and we saw more permanent structures being built too. 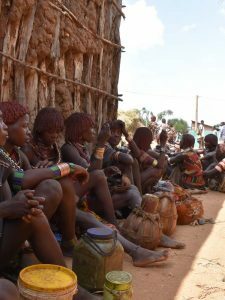 About 50,000 Dasenech people still live in the Omo Valley. 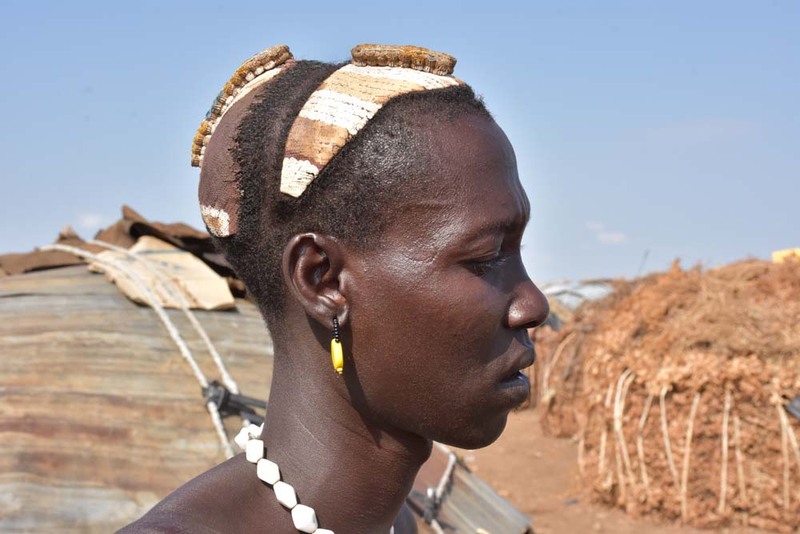 Like the Hamer people (see below), they also use red ochre for decorative purposes, although a lot less it seems than the Hamer people, the men wear mud caps, and both men and women use intentionally-made scars as a sign of beauty. 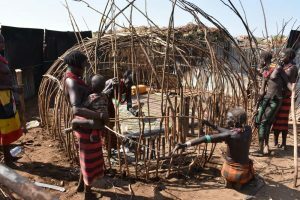 We watched the women build a home for a new arrival in the village, indicated by a small fence around the structure within the bigger fence of the village. The men of the village were intrigued by our binoculars and loved to look through them. We spotted some interesting birds in the trees next to the river, including a tiny pygmy kingfisher that made Jon’s day, as he had never seen one before. 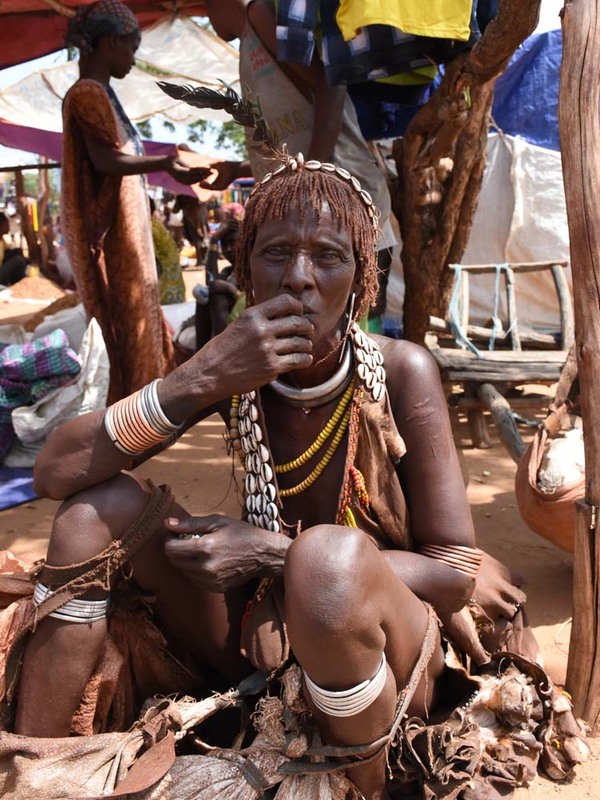 Another tribe living in the Omo Valley, numbering less than 50,000, who are also pastoralists now growing some crops. The females of the Hamer people, rub a mixture of red ochre, water and butter in their hair, and twist them into dreadlocks. They wear goatskins decorated with beads and metal bangles that make quite a lot of noise when they walk. 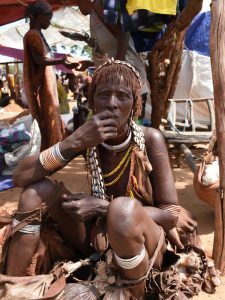 The men who have killed wear a mud cap, painted with red ochre and lime, and often wear an ostrich feather in it. To ensure they can protect their hairdos they always carry a little stool with them, which they use as a headrest. 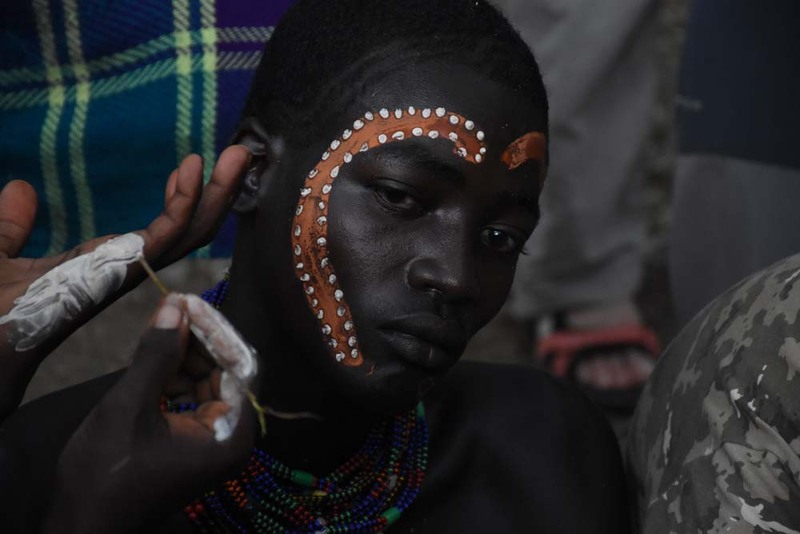 Both men and women use the red ochre as decoration, and create scars in intricate patterns on their bodies with thorns. 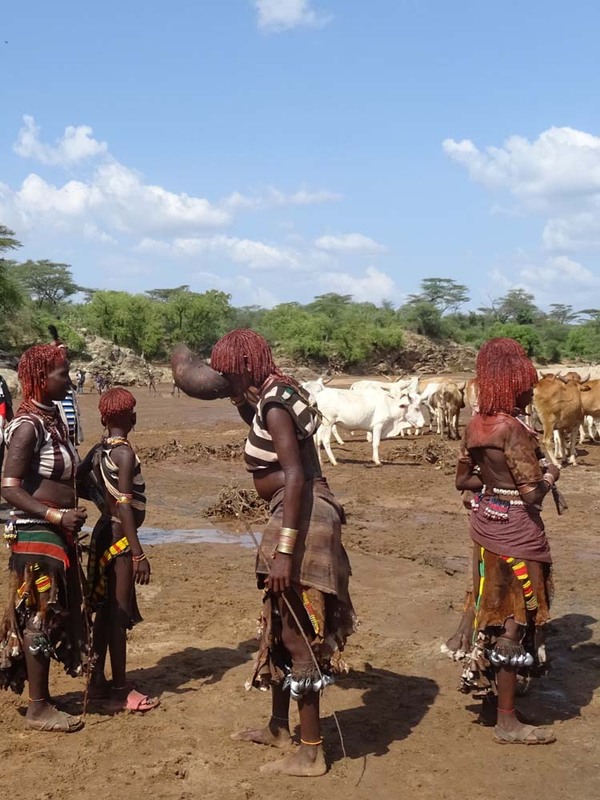 But the tribe is most widely known for the male rite of passage, bull-jumping, or bullah. It is easy to say the women want it, we saw they really are begging the guy to hit them, so what’s the problem? 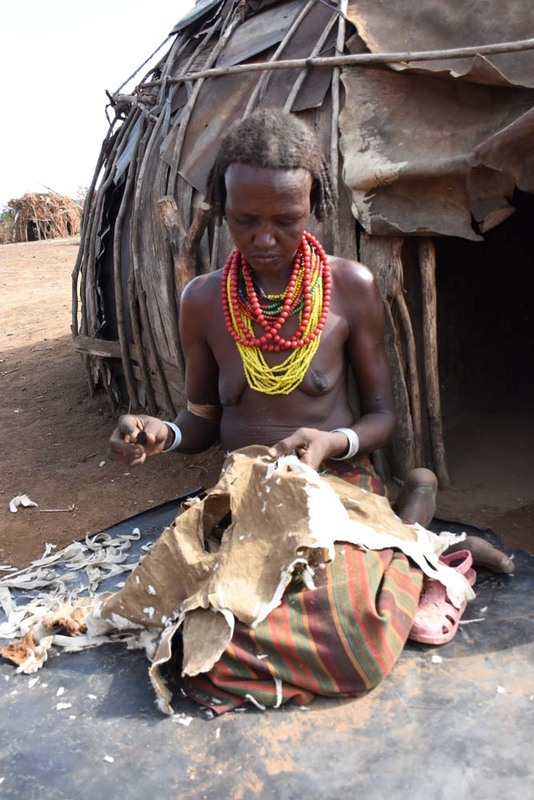 But in our opinion it’s not fine, as we feel women within the tribe really don’t have the option not to participate, as not having any scars on her back would mean she would be ousted, she would not be able to marry, nor be part of the community. And then what? So really, they don’t have a choice. It was repulsive to watch, and it went on for a long time. In fact, we heard the rumour that when tourists are present they tone it down a bit, but if this was a ‘light’ version of the beatings, we really can’t imagine how horrific the full version must be. Finally, after what felt like hours, the women all marched off. 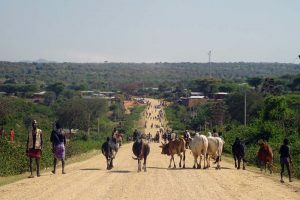 The bull jumping takes place somewhere up the road, in a clearing in the bush and we all wandered over. The bulls were there, and after a last ceremony where we caught a few glimpses of the young boy (and realised how young he really was, maximum 12 years old), they were lined up for him. He had a short run up and managed to leap onto the first bull, scramble over the 6 or 7 backs, and successfully jumped down on the other side. On the return he struggled to jump onto the first bull as they didn’t have a small one on that side, but with some strong, helping hands he managed to get onto his feet and quickly back to the other side. Another easy jump up from the initial side, and another more difficult clamber on the far side, and the boy became a man. The bull-jumping had been an interesting ritual to watch, and we felt privileged to have been there. But the beating of the women meant we felt very uneasy about it all. 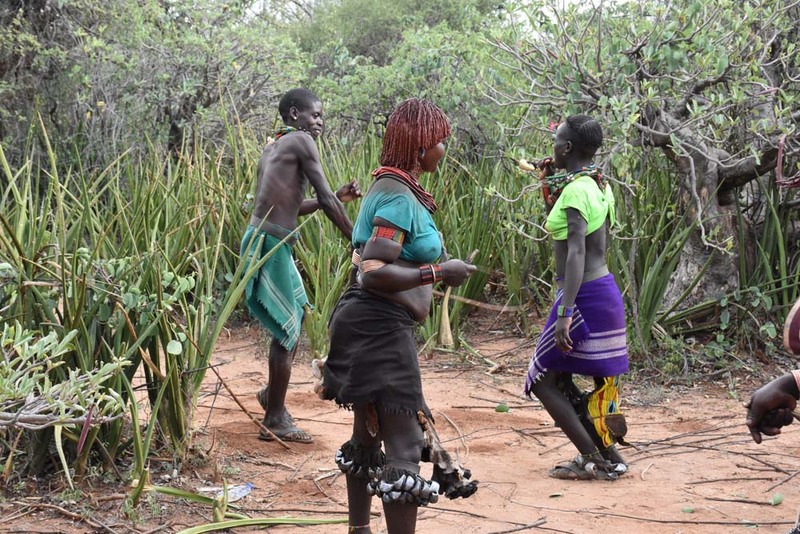 Back in their village they will be celebrating into the wee hours of the night, and the newly shaven boy will now be a maz until his family finds him a bride, and, more importantly, finds the money to pay for the dowry of his bride. 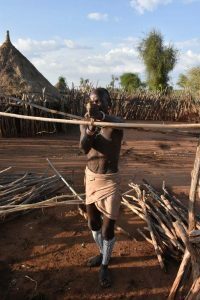 The Mursi tribe, around 7,000 people, are pastoralists who live in the remote south of Ethiopia, inside the Omo National Park. 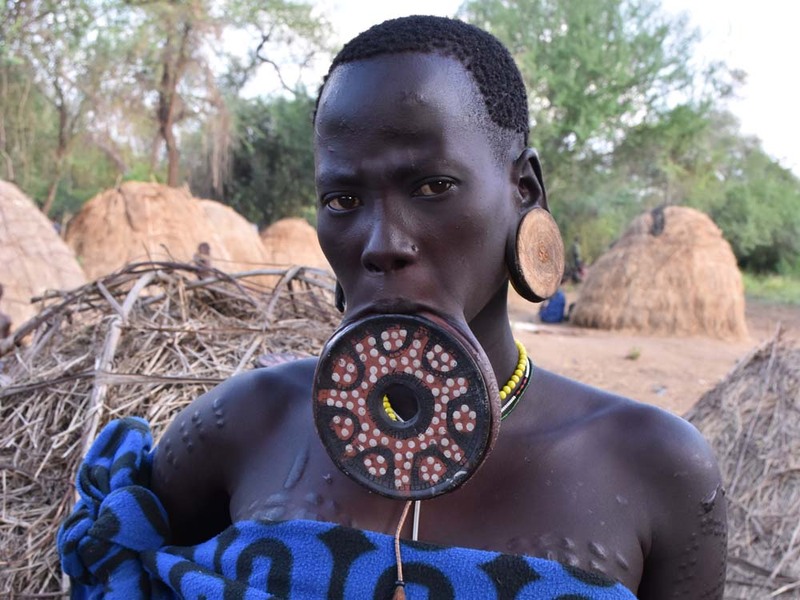 They are famous for the plates the women display in their lips. To achieve this beauty status, mothers of girls between 15-18 years old, cut a hole of about 1-2 cm in the lower lip. This is usually done about 6-12 months before the girl gets married. With a piece of wood in the opening, they wait until the wound is healed, then replace it with a bigger one. When the hole is approximately 4cm, the girl makes her first plate from clay and decorates it. Girls continue to stretch the hole if the skin allows, the final discs are mostly around 8-13cm, although some are nearly 20cm. We didn’t stay long. 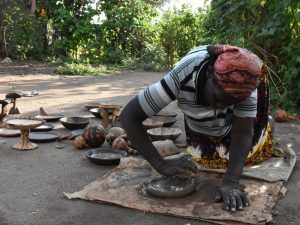 The village we visited no longer goes about their daily business. Instead, women aggressively push themselves in front of you, demanding a photo and the obligatory payment. 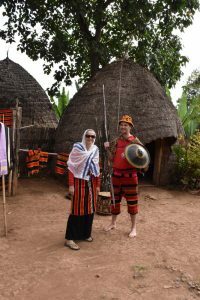 We understand they are trying to use their uniqueness as a tribe to earn money, and we were happy to pay for a photo, but their pushy way was extremely unpleasant. We much preferred the way of the Dasenech tribe where you paid one fee to one person to cover all photos, even though the fee was higher than we would have paid for individual photos. 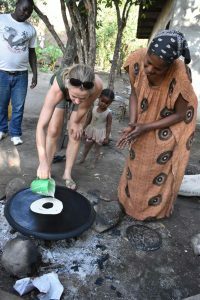 It meant people in the village could relax, and go about their daily business, children weren’t neglected, and meals were prepared. The Ari is the biggest ethnic group in the Omo Valley with more than 300,000 people. 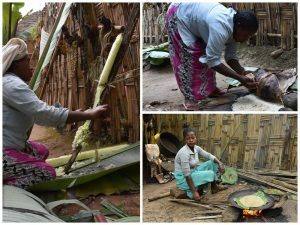 They mainly grow coffee and sorghum, used for consumption as well as for rituals, but also fruits, and they keep some livestock. They also produce excellent honey which we often saw for sale in the markets. Most of the Ari people in the urban environment now wear modern, western-style clothes, although women are still often seen in the colourful skirts made of enset (false banana trees), which have a short double layer at the top. They are also known for their pottery, and often sell the injera plate which is made of clay. 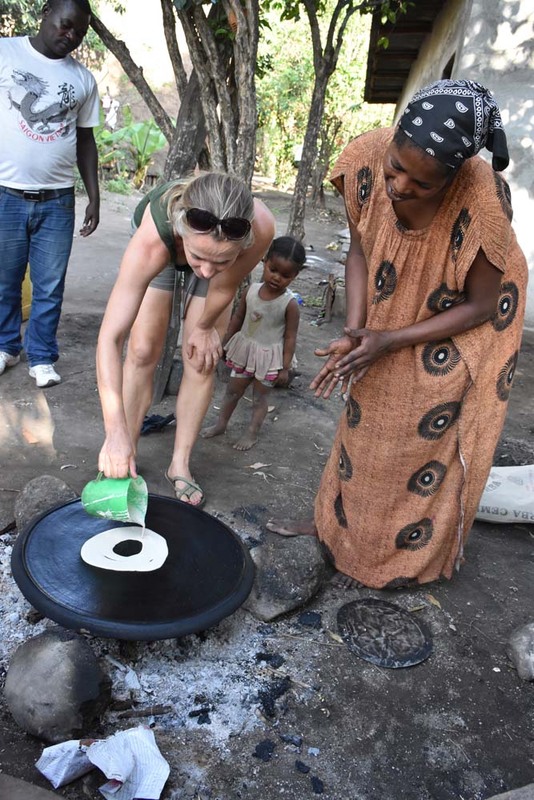 Jude practices making injera, and we try some of the locally brewed, highly potent spirit. It’s quite a modern-looking village, but our guide shows us interesting things of their daily life, including the local bar, hairdresser, and very young blacksmith. 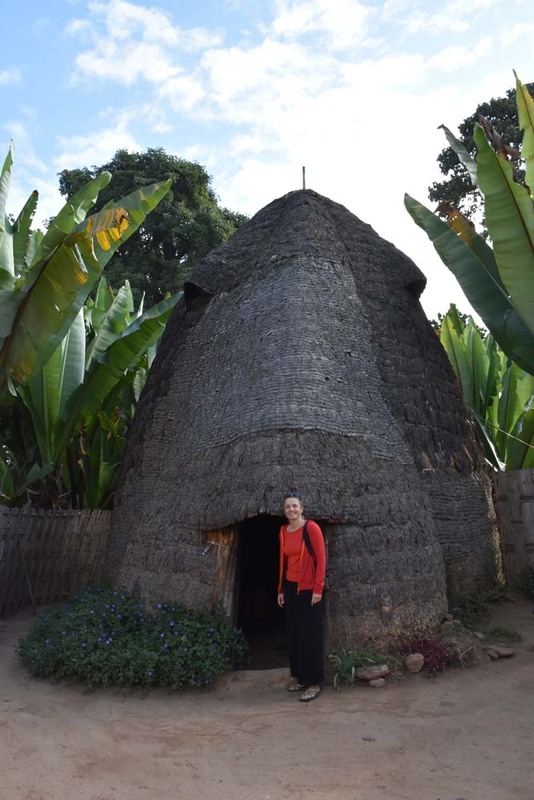 On our way to the Bale Mountains we stopped at the villages of two more tribes; the Konso and the Dorze. The Konso people, currently numbering around 250,000, traditionally live on hilltops, in very densely populated villages surrounded by stone walls that can be up to 2m high. Each house has its own small compound also surrounded by stone walls, with only one small entrance. In between are narrow and sometimes steep alleyways, meaning the villages are easily defendable against any outside attack. Each layer of the village has its own community house, the mora. 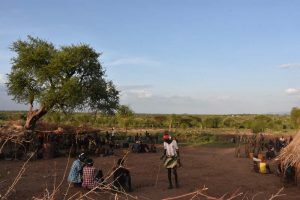 In the open area underneath the first floor, girls, boys and men can relax and play, and all boys from the age of 12 spend every night under the thatched roof of the mora until they are married. 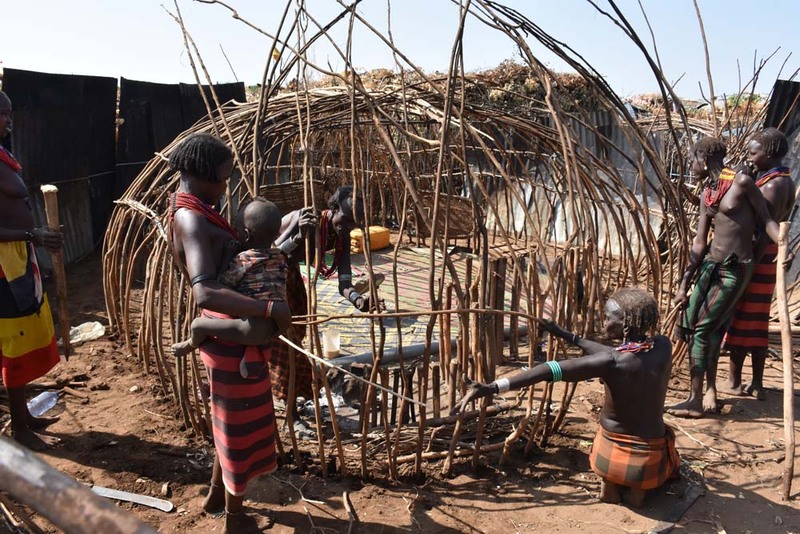 Although also married men occasionally sleep here when they are evicted from the family compound during a fight with their wife. 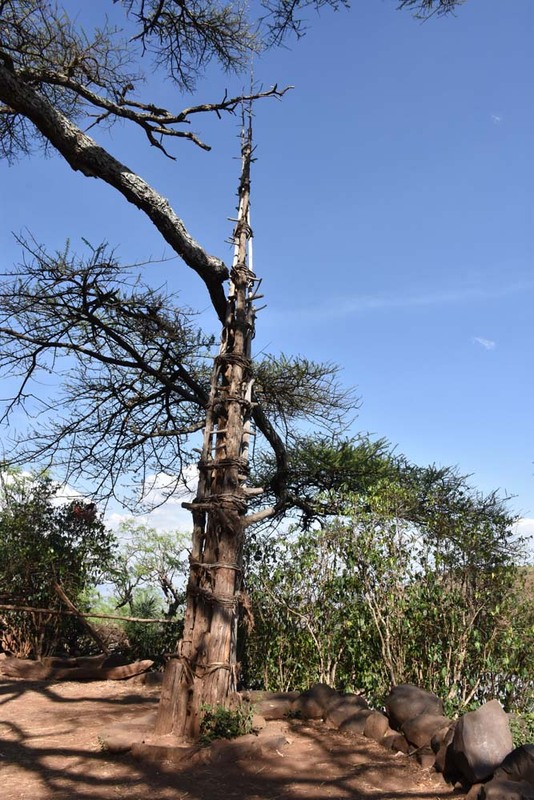 Next to the mora you can find the village totem pole, where every generation (18 years) a new tree is added. 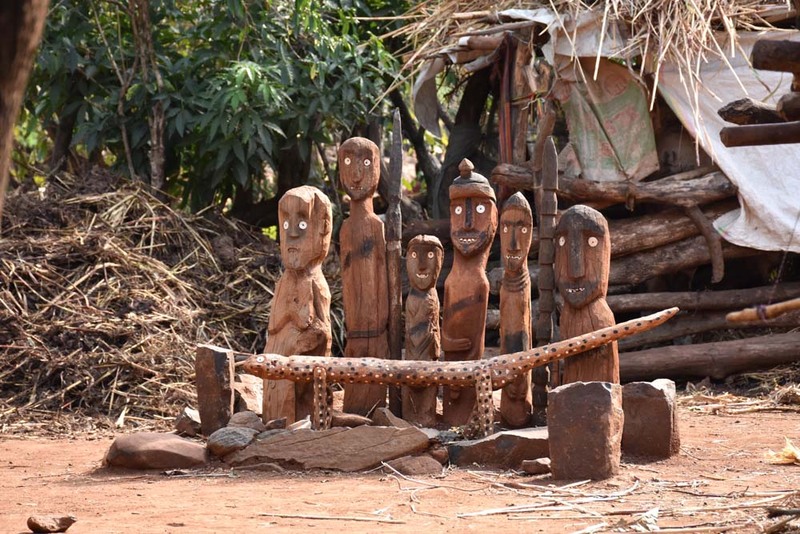 The Konso are also famous for their waga, wooden grave markers erected for the important Konso men and the warriors. Interestingly, although they grow coffee, they don’t drink the beans. Instead they prefer to use the leaves, which are sun-dried, ground into a powder and mixed with sunflower seeds and a range of spices. This mixture can easily be stored and used as a sort of instant coffee, add hot water and you’ve got yourself a nice cuppa. Jon managed to lift the heavy stone found in the courtyard of the mora, which is used as part of their initiation rite, and throw it backwards, proving he is indeed a man, not a boy. 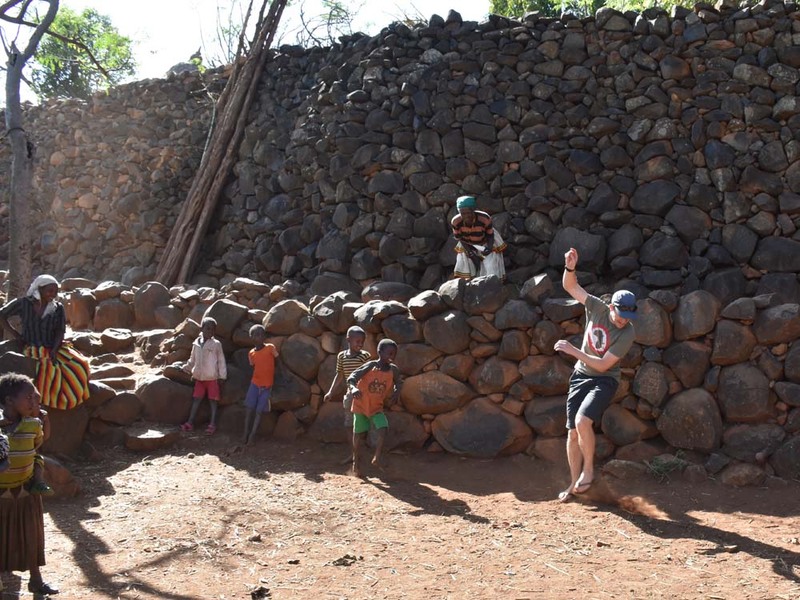 And both Abiy (our guide) and Jon joined the local kids in a game with a ball where the aim is to hit the other person with a ball, if you do, you take the place of the person in front of the wall. 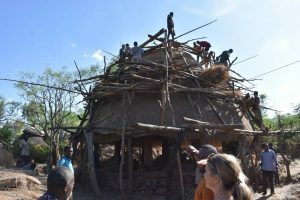 As we left the village we watched the men building a new mora, very impressive work as the thatched roofs are quite high. 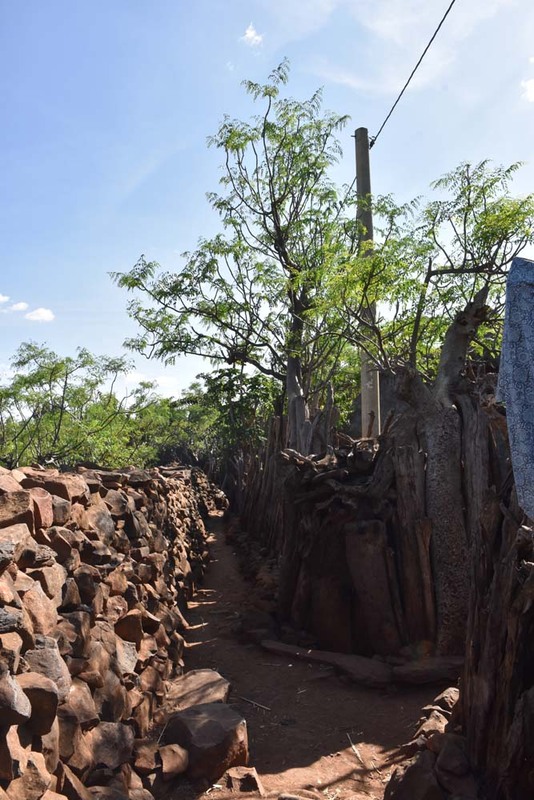 The Dorze people, around 30,000, make the most impressive, beehive like houses, we have ever seen. They are built from bamboo poles and then covered with leaves of the false banana tree (enset). 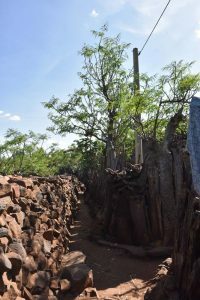 The whole beehive when newly built, a process that takes roughly three months, is about 6m high, and inside it is one space, there are no floors dividing up the structure. The animals all share the space with the family. 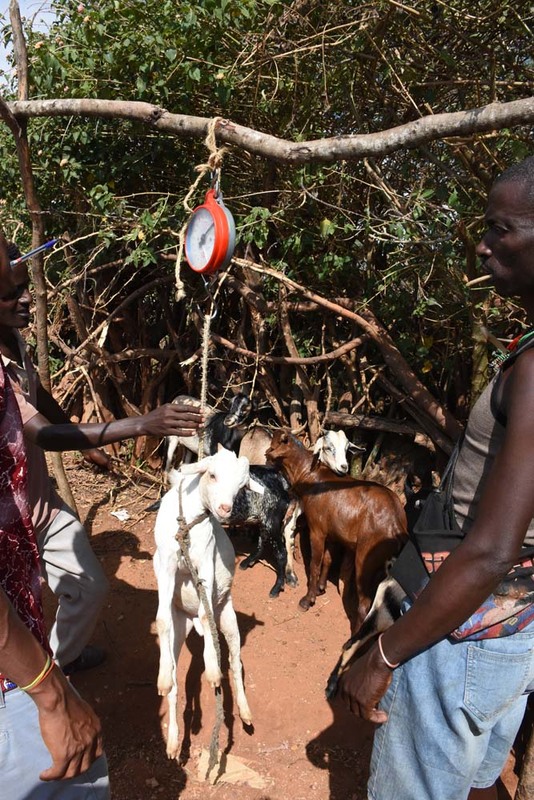 In this house we found 3 goats and 5 cows! 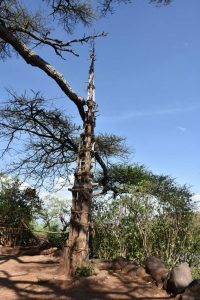 If the bottom becomes infested with termites or is rotten, the whole house is lifted up and placed somewhere else, a little smaller this time. That way it lasts a couple their whole life. Ingenious. A fermented paste is made from the enset, or false banana, and used to bake a tasty, sourdough flat-bread. And of course they also use the plant to make their own version of gin, a very strong one too. 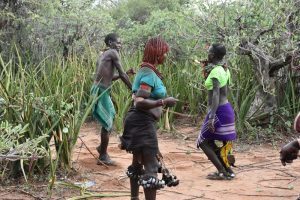 We thought it was very interesting to peak into the lives of a few of the world’s tribes who are still living the way they have been for centuries, and understand a little more about their way of life and the ancient traditions they follow. 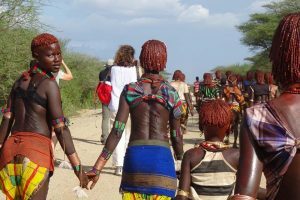 We think tourism helps some of these tribes maintain their traditions and culture, although there seem to be challenges to do it right. 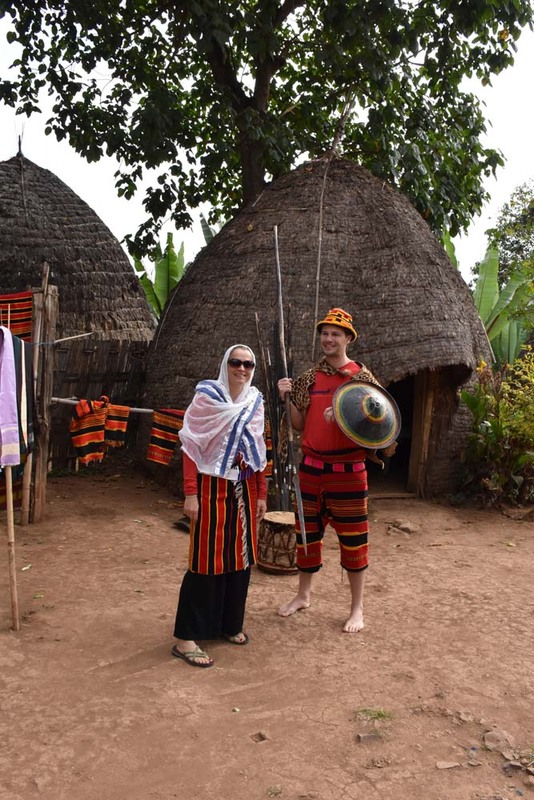 Giving the tourists an interesting, representative experience, whilst maintaining cultural dignity seems a hard thing to balance. 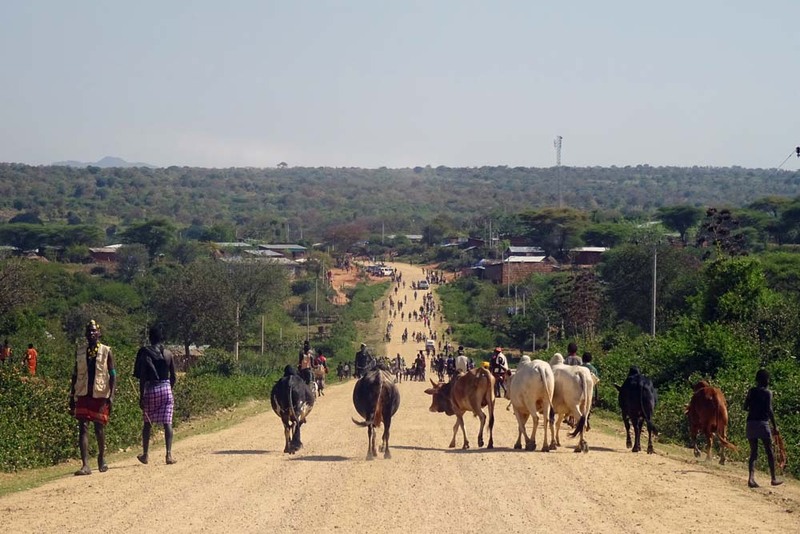 The biggest threats to their way of life seem to be external, where things like dams are threatening to swallow up their ancient homelands, and a desire from young people to live like the rest of the world they see through an increasing presence of the internet. But of course, like everywhere else on our planet, the ever-expanding Ethiopian population doesn’t help either. Certain traditions would be best left behind in the past, especially the violent ones, but others could and should be celebrated as a unique way of life. Diversity on this planet is a good thing, in traditions, way of life, food and clothes. 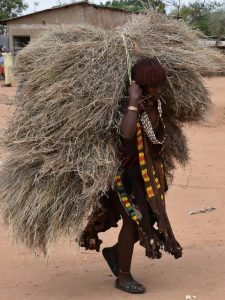 They keep life interesting and we hope the tribes in the south of Ethiopia find the right balance to continue living the way they do well into the future. Great commentary Jude. Really genuinely interesting people and cultures. I have wonderful memories of tribal people from my boyhood in PNG; sad to think of all this diversity slowly disappearing. But terrific to see you and Jon out there exploring. We’re in northern Argentina working our way up to Peru over the next 3 mths, and hoping the wet season ends soon…..pretty wet at the moment. Thanks Guy! How come I didn’t even know you spent years in PNG? You’ll have to tell us some stories next time! Yeah, I hope they find ways to maintain some of their cultural values into the future… it will be challenging for sure. Oh nice! Does that mean I need to start following the blog again? 🙂 Enjoy South America again, fingers crossed the wet stops soon! Great story and great part of the world. Thankyou for an outstanding and enlightening insight to the aboriginal peoples of Ethiopia. On the day after a horrific display of terrorist hatred in Christchurch (NZ) it is uplifting to read of the celebration of diversity, even though there are many challenges as you point out.